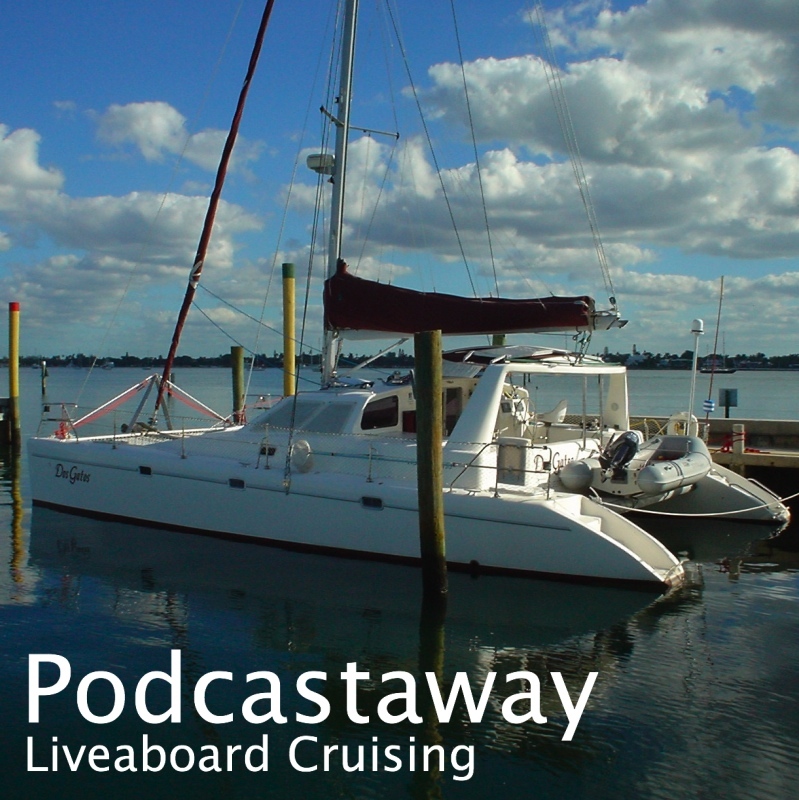 We're in Tahiti and I have just posted my latest podcast. It was recorded over the month since we left the Marquesas and visited the Tuamotus. It may be downloaded or subcribed to from my podcast page. Our final stop in the Tuamotus was Toua Atoll. This is a small atoll a few miles northeast of Fakarava. There is but one entrance into the lagoon which we passed through and dived, but the drift diving was not as good as Fakarava. The pass is shallow -- around 25 feet -- so the bottom is flat and uninteresting and the flow was fast (although that probably suggests we dived at the wrong time). We also saw two Silvertip Sharks, which can be dangerous, so that made us even less enthusiastic about the dive. We moved outside around to Anse Amyot a deep bay on the northwest side of Toua. There is a pass that leads nowhere -- the inner side is blocked by coral and does not open into the lagoon. Valentine and her family have put down moorings and run a restaurant and pension in the bay. They also run a small pearl farm and she showed us how they graft oysters to make cultured pearls. We dived outside the atoll on a wall that dropped vertically from 60' to 3000'. Now we have left and are underway to Tahiti. We did more drift diving at Fakarava Atoll. The southern Passe Tumakohua was ideal. There was an incoming current in the morning that wasn't too fast -- probably because the pass is deep. We dived it once by ourselves, drifting with the dinghy, and then we got together with several other boats for a group effort. On each dive, we saw large numbers of Gray Reef Sharks in the depths of the pass -- at maybe 70 feet. It was hard to count them all as we sped along by them but I counted 25 in view at one time, and 15-20 in view at others. So there certainly had to be well over 100 sharks in that pass! The book says that this type of shark can sometimes be aggressive -- "do not approach if it is displaying threat behavior". The 100 in the pass were curious but mellow. We traveled through the Fakarava lagoon, with a stopover half way, to the north end where the village of Rotoava is located. Here we stocked up with (pricey) produce and ate out, for the first time in a month. We've been in Makemo Atoll for nearly a week. Until today we've been anchored off the village near the Arikitamiro Pass where we entered. The village has two small stores and bakery (order your baguettes by 9am, get them after 11am). 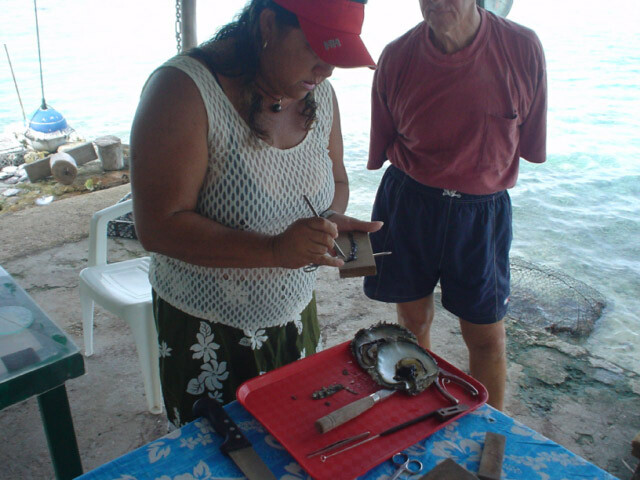 The industries of the atoll are copra and pearl farming. Ginger wasn't interested in copra! We met Felix, owner of a pearl farm, and in company with two other boat crews we went over his stock. 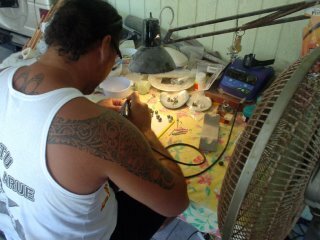 We also met Becko, who carves pearls, and admired his work. We've also made four dives here so far. The best were two drift dives in the pass. Four of us dived with the crew of another boat as surface cover. I towed a float on a reel so they could follow us. In each case, despite our study of tide tables, the current switched to outgoing before we expected (it's much safer to drift into the atoll than out). On the second dive, the last part was conducted at 3-4 knots outbound! We surfaced in the very choppy water that is characteristic of strong currents in passes and were very happy to be picked up. The dives were exceptional; visibility well over 100 feet, perfect coral, thousands of fish, huge schools of snappers, white-tip sharks, many new fish species. Until the current got too strong, Ginger was photographing everything. I took down video which suits such conditions well. Last night the wind piped up from the southeast and the anchorage became very choppy. We moved east this morning and are now anchored at the extreme east end of the atoll, the best shelter from the easterly winds. In a day or two, we'll return to the village (to pick up some baguettes) and then we'll go to the northwest pass prior to moving on.